Speed and Consistently Reliable Results. 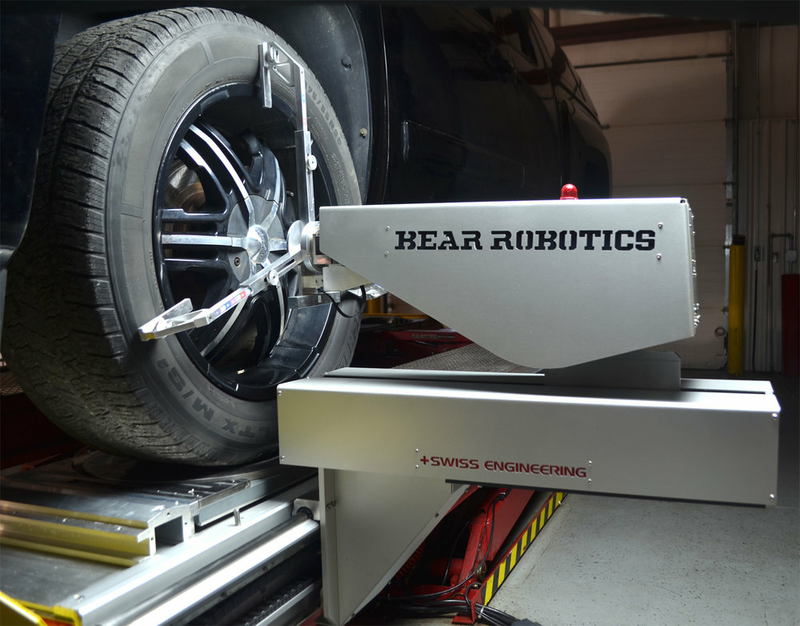 The BEAR Robotic System gives automotive shops the ability to have the same cutting edge technology as the world’s vehicle manufacturers at affordable prices while achieving factory performance and accuracy. Vehicle alignment plays a critical role in the performance and safety of your vehicle. No one knows that better than Bear. That's why we've spent decades perfecting our alignment machines to be the most accurate in the industry. The SBA system is our flagship aligner that ensures proper alignments every time to improve fuel efficiency, increasing tire life saving you money. Systems come with 6 or 8 sensor wireless wheel units with our most highly developed CCD technology. Wheel units include dynamic adjustable-brightness green LEDs and ultra precise cameras to ensure exact measurements . Wheel units mount to tires with robust self-centering aluminum rim clamps. All wheel units are Made in the USA with rugged all-aluminum construction and come backed by a unique 5yr warranty. Bear SBA aligner will never let you down. toe and Camber sensors are accurate up to .005 degrees. They can sense and record even the slightest amount of movement. Clampless system - No mounting rim clamps, wheel unit sensors, or targets. Simple caster swing - Each robot continuously changes its position to stay accurately attached to the wheel. Live Caster - turnplate floats and rotates on top of the turn plate assembly and Live Caster is achieved by the entire turnplate assembly floating on top of its own rolling table. Turnplate assemblies are constructed of non-corrosive materials and are easy to disassemble and clean. Easily position the rear turnplate ramps with built-in spring loaded rollers along the robust aluminum rails. Software offers options to measure and display Toe, Camber and Caster in different units such as millimeters, decimal degrees, degrees and minutes etc. Robot Dimension (Each): 27" x 16" x 16.5"